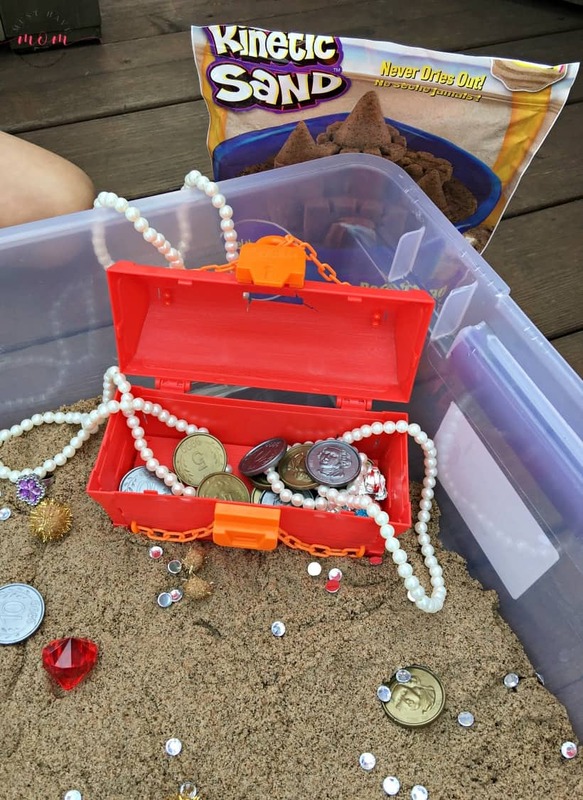 This pirate treasure hunt sensory bin with Kinetic Sand will keep kids entertained for HOURS! I’ll show you how easy it is to make! 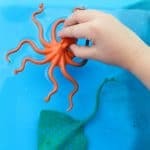 Great for unwinding after school or keeping younger kids busy while the older kids are at school for the day. Thank you Spin Master for sponsoring today’s post! 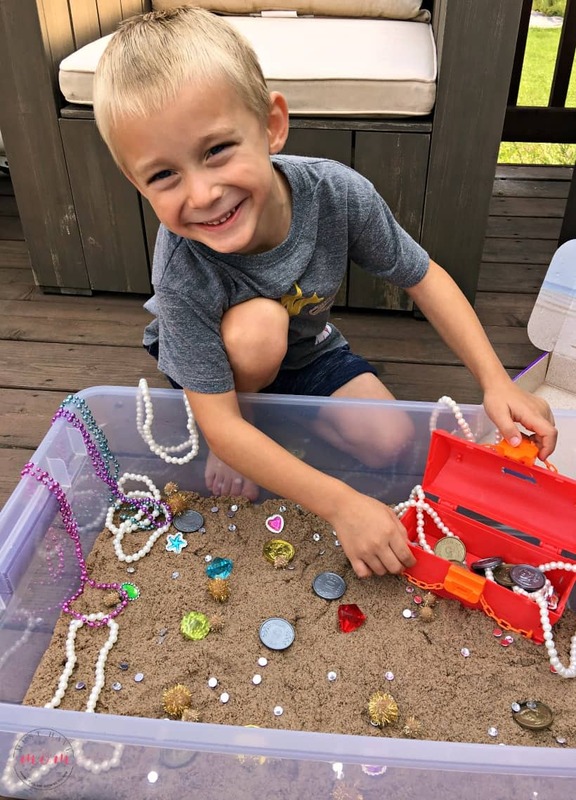 Before we dive into showing you how to create this super fun pirate treasure hunt sensory bin, you may be wondering what a sensory bin is. A sensory bin is typically a large tub/container or table with a container built into it that is filled with various materials designed to stimulate the senses. You can use a variety of materials in a sensory bin including water beads, rice, dry pasta, water and our favorite, Kinetic Sand! It typically also includes other supplies in it to help create a fun themed experience. You can check out some of our other sensory bin ideas including our ocean sensory bin, frozen ocean sensory bin, ocean pollution sensory bin, rainbow jello sensory bin and more here. 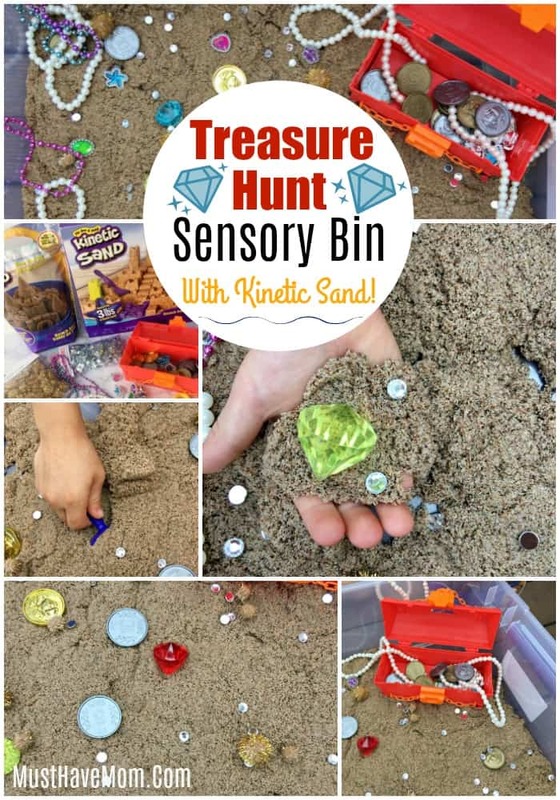 Now that you know what it is, let’s get started making a treasure hunt sensory bin!! 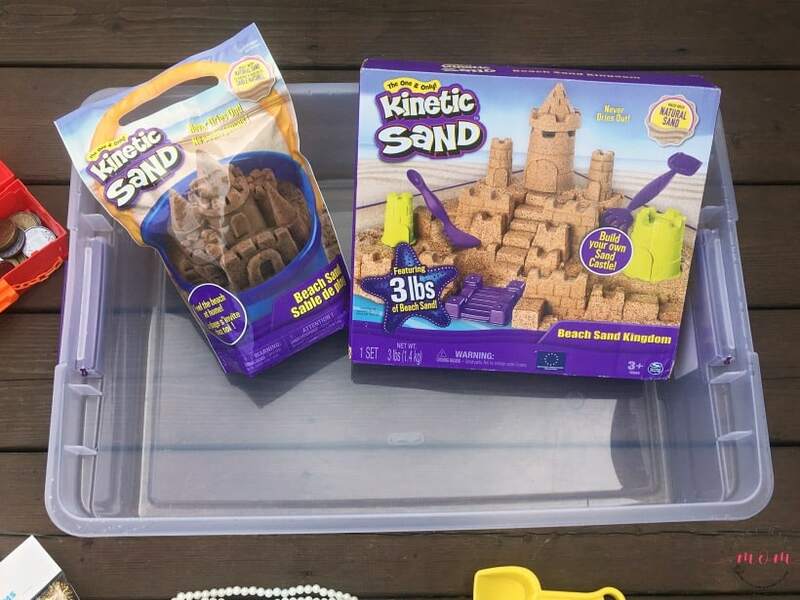 Begin by filling the tub with the Kinetic Sand beach sand. The Kinetic Sand will come out of the package in a big lump. Spread it out flat on the bottom of your sensory bin. 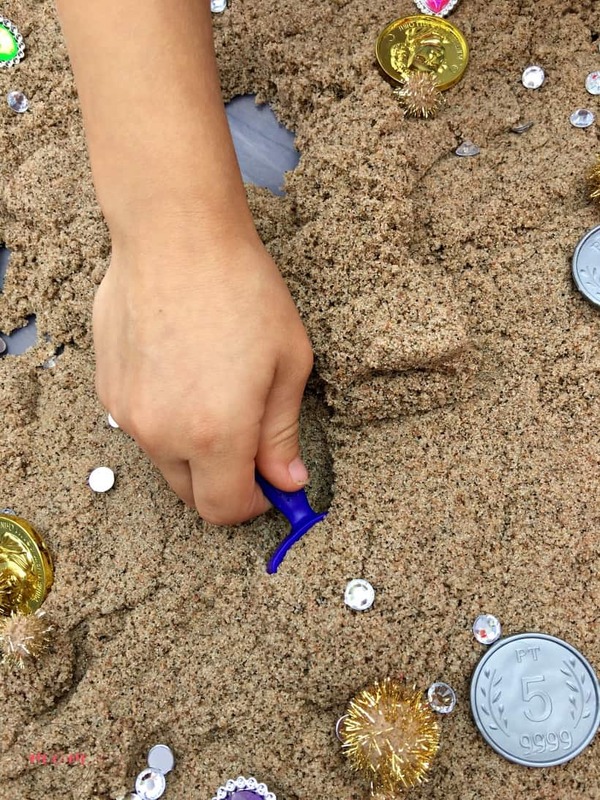 Place a treasure chest in the corner so they can collect the treasures they find in the sand. I found this one in the dive toys section. It works great! You could also use a wood treasure box from the craft aisle. 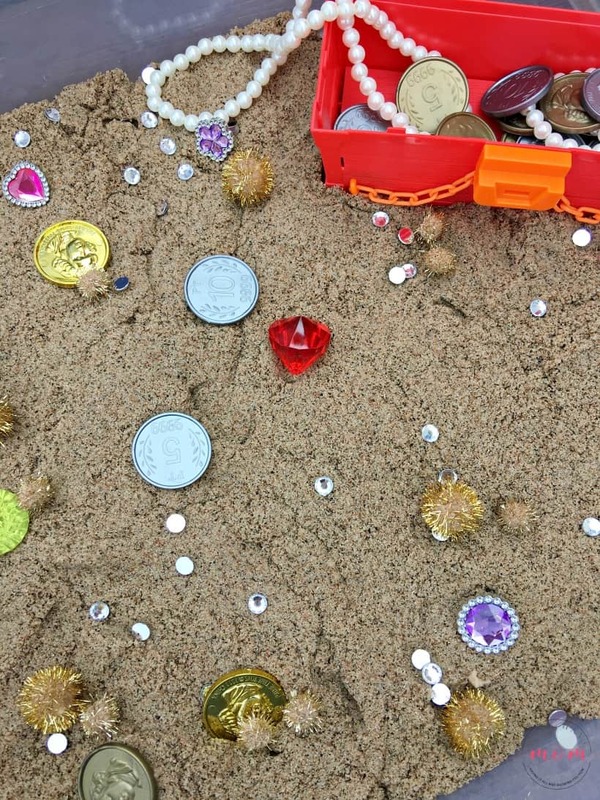 Next, add the treasure to your sensory bin. I added play pearl necklaces, gold coins, gems, small gemstones, play rings, and gold pom poms. 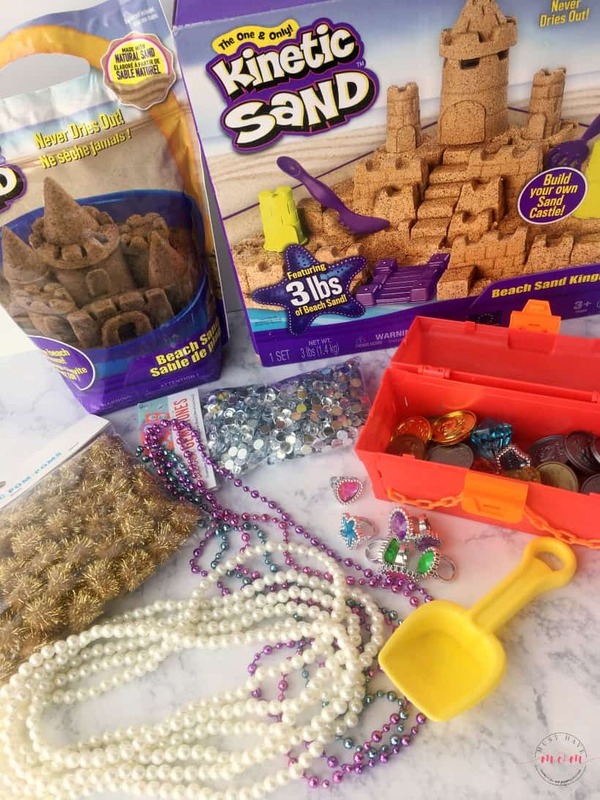 Use the digging tools that are included in the Kinetic Sand Beach Sand Kingdom set. 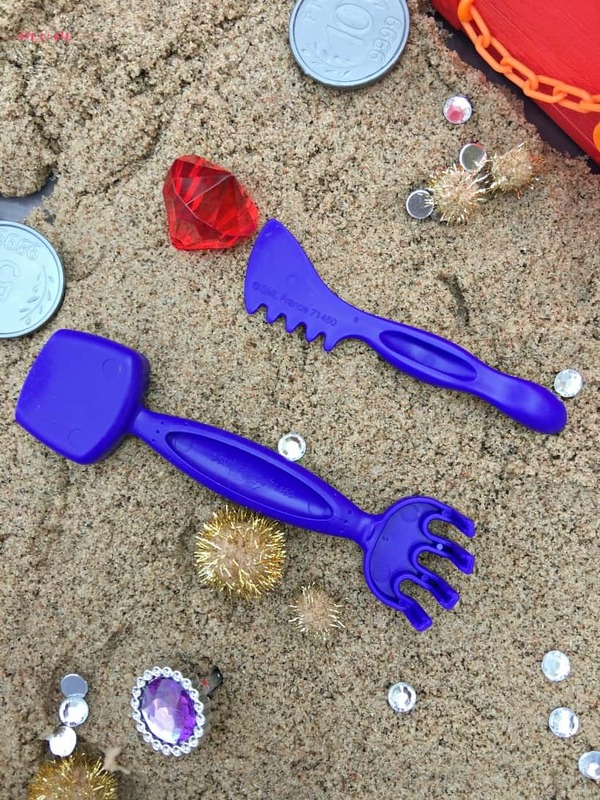 Kids can use these to help dig for the treasure! 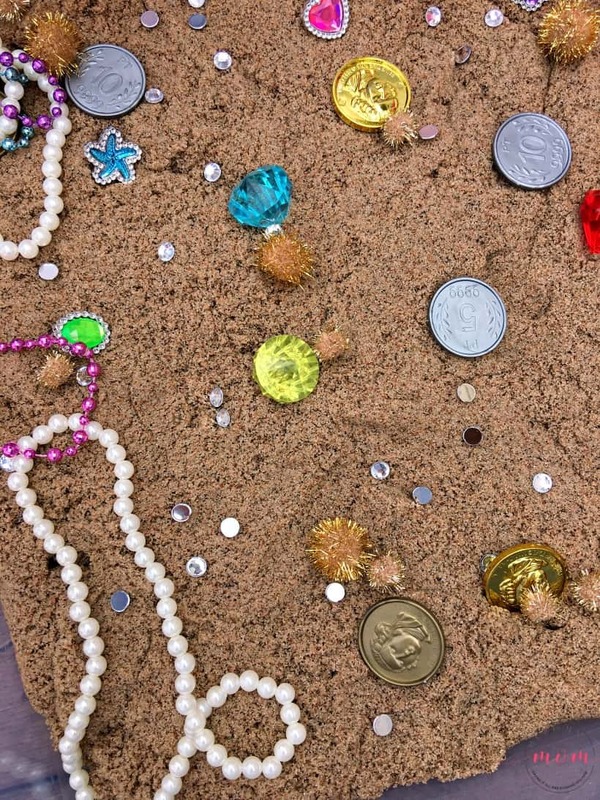 Once you’ve added all the treasure be sure to mix it all up and bury some in the Kinetic Sand. 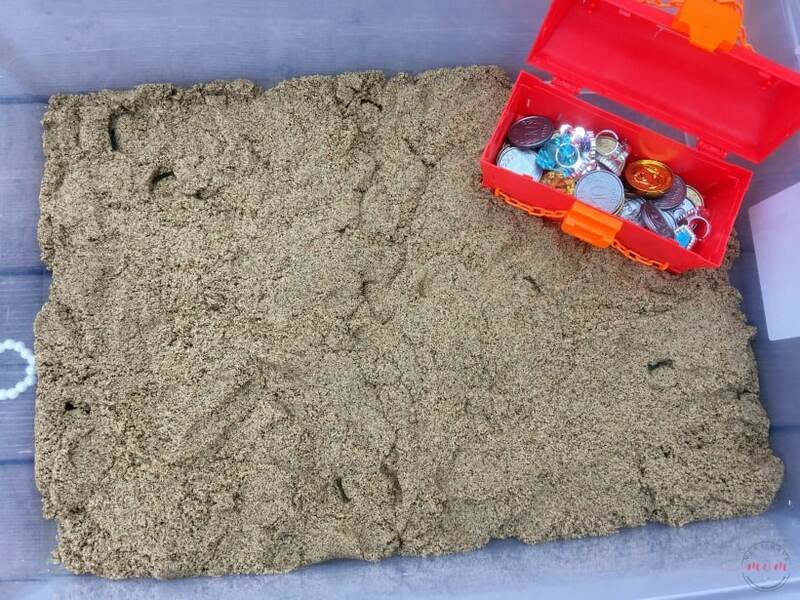 We always choose Kinetic Sand for our sensory bins because Kinetic Sand is just about the coolest sand ever and is far less messy than plain sand is. It doesn’t even stick to the fuzzy pom poms! It’s really neat. Kinetic Sand is 98% real sand and 2% magic and it oozes, moves and melts right before your eyes. It is completely moldable and always holds its shape. It’s so cool that even I love playing with it! Kinetic Sand is made with 100% natural sand is free of gluten, casein, and wheat! 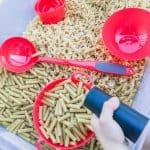 It is safe for kids with these allergies to play with (especially for kids who are allergic to the ingredients in Play-Doh). 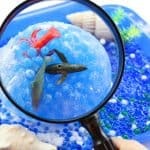 Now it is time to let your kids play with the treasure hunt sensory bin! Brady starts preschool this year and he will go 3 days a week. The other 2 days that his siblings are in school he tends to get SO bored. This sensory bin will keep him entertained while he awaits their arrival home from school. It’s also fought over by my older kids who love the Kinetic Sand just as much as Brady does. It’s a relaxing after school activity for them to unwind and have some time to relax after a busy day. 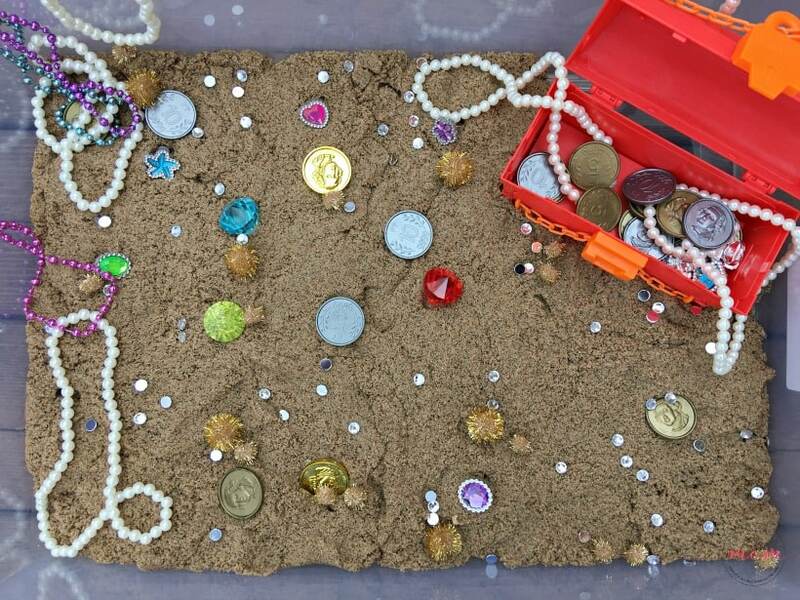 Kids can find the treasures hidden in the sand and then place them in the treasure chest! Brady loved pretending he was a pirate searching for treasure! He also thought it was cool to pretend he was mining for diamonds. This sensory bin has kept him busy for hours on end. He would find and rebury the diamonds over and over! He also loved how easy it was to mold and shape the Kinetic Sand, so he could build new challenges for himself with the sand, and squish them back down and start all over again. Plus, it’s not messy! Kinetic Sand sticks to itself and not to your kids so clean up is a breeze. It’s one of the few molding formulas I’ll allow in my house because it doesn’t make a mess. Kinetic Sand is a great tool to help develop fine motor skills and stimulate children’s creativity. This is just one sensory bin idea that you can create with your sensory bin. 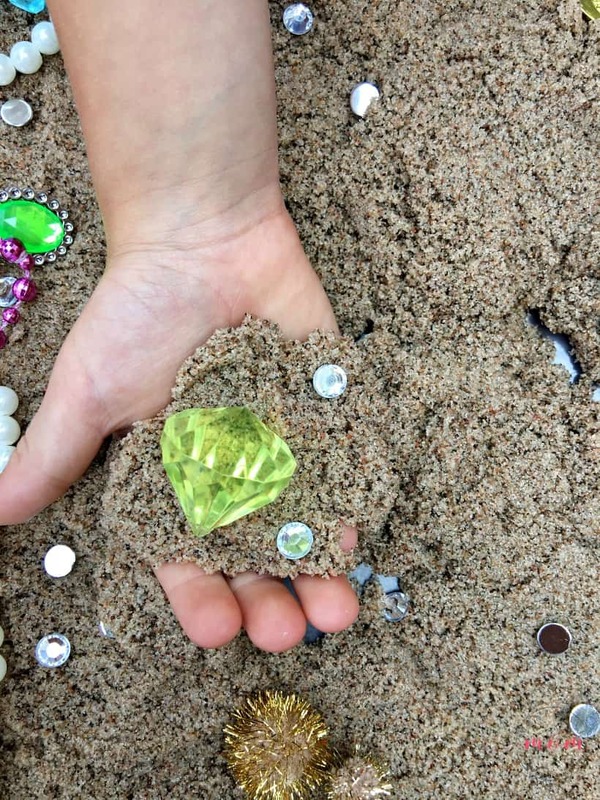 Kinetic Sand never dries out, so you can use it over and over again in all sorts of different sensory bin ideas! Buy Kinetic Sand here and don’t be fooled because there is only one Kinetic Sand and I’ve yet to find another like it! « Solve Dinner Dilemmas With This Trick! 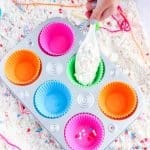 You are right about one thing: This activity will keep kids entertained for hours! I like this a lot! And, it’s not going to break the bank with supplies needed! OMG I wanna dig in there and find some treasures! I love Kinetic Sand… that stuff is absolutely amazing and feel so neat! Kinetic sand is so much fun! I think any kid would love digging for buried treasure in that. This is such a fun DIY! I love how you can hide such cute little treasures in it for a fun hunt! My 6 year old would love this!!!! I love this idea. This is something that my girls would really love. They love a good treasure hunt. We love Kinetic Sand! So easy to clean up and fun to play with. What a great idea to do a treasure hunt. We love Kinetic Sand! This is such a fun idea! My kids love the beach and this is way better when it comes to cleaning up! I’ve seen one done with real sand at our children’s museum, but I like the idea of using kinetic sand instead. Seems much more sanitary! It’s much less messy and much more fun! This is such a great idea! Really fun! Kids will surely love this! We have gone treasure hunting in the sandbox at a birthday party. It was pirates and princesses. My youngest daughter is three years old and would love this so much. She does attend preschool but I’m not sure if they have a sensory bin in their classroom. I’m sure she would love it on our back patio after school one day this week! This sensory bin is so cool. My cousin’s little one would love playing in it. I want to play in it. This activity looks like it would be so much fun! My girls and even my son who is a little older would still enjoy this.